Richard Gere is having a hell of a year, pardon the rhyme. Back in the spring he gave us The Hoax, about a disgruntled journalist who tells a little white lie that gets him in trouble with the United States government. 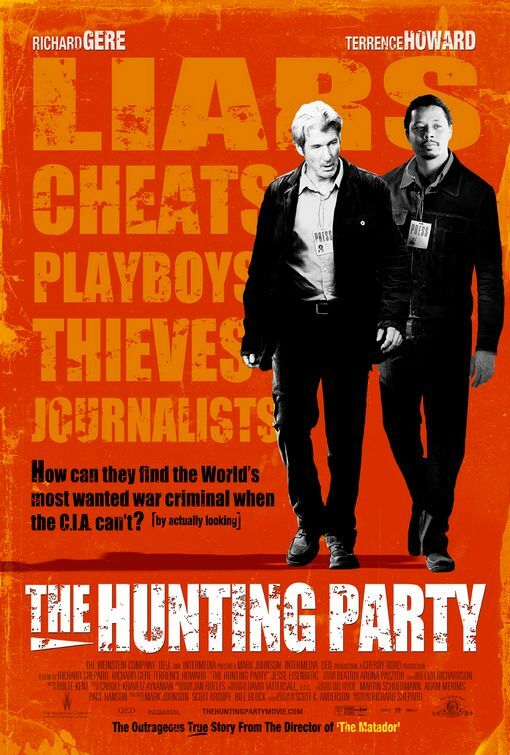 In his new film, The Hunting Party, Gere plays a… well, he plays a disgruntled journalist who tells a little white lie that, ultimately, gets the US government involved. And yet these two films are miles apart in tone, style and message. The Hunting Party is marketed as a very black comedy and while it has some funny moments, there are some scenes of such brutality that labeling this any kind of comedy seems rather presumptuous. And yet those scenes are crucial to the understanding of Gere’s character Simon, a disenchanted, former hotshot network foreign correspondent. The film is told from the point of view of Duck (Terrence Howard, in what may well be another nominatable role), Simon’s long-suffering cameraman. When, in the first five minutes, we watch the extreme of human tragedy present in 1995 Sarajevo take its toll on Simon, we have to wonder what we’re in for. Duck has told us how Simon was the absolute best and watching him drink his way through a live report makes us second guess our story-teller. When Simon reappears five years later with a plan to go after The Fox, a Ratko Mladic -style dictator wanted for war crimes and on whom a $5 million dollar bounty has been placed, we begin to understand a little about the method to Simon’s madness. See, writer/director Richard Shepard (also responsible for 05’s The Matador) folds a history lesson in along with the redemption story that we are watching unfold and he does it effortlessly. At no point did I feel like we were being given random exposition in order to make us care about the characters and the situation they had put themselves in. Instead, we are allowed to follow Simon and Duck (as well as our story stand-in, virgin field producer Benjamin, played by Jesse Eisenberg) and discover the whole truth of post-Bosnian war Serbia. The atrocities committed are not singled out, but are just another piece on the puzzle, which culminates with the three reporters managing to do in two days what every major international police force had not been able to do in the previous five years – track down The Fox. At the very beginning of the film we are told that only the most absurd portions of the story are true. As the film winds down and our heroes do what they’ve ostensibly set out to do, we begin to understand what that brief epigram signifies. Throughout, Simon and his team have run into snags while dealing with the local police, the United Nations Police Force and even the CIA, all of whom have a posted mission to find and capture The Fox and none of whom can take even the most infantile steps in that direction. Shepard very deftly raises questions which can, and should, spark discussion long after the lights have come up. He succeeds where other recent films have failed. This isn’t to say his every touch is golden. The scenes with Duck’s girlfriend are strained and obvious and James Brolin, as the network anchor, is a weak link in an otherwise strong chain. When the film ends, however, Shepard let’s us in a little bit on the gag. The movie is based on real events and he shows us the players we may have thought were dramatic representations to prove a point. They are not. In fact, he even softens up some of the real characters in order to make them more palatable for an American audience, since the implication of what we learn just before the lights come up is devastating. In the end, Shepard may have been at the rudder, but the engine driving the whole thing is Gere. His performance is both cynical and heart wrenching and that is not an easy combination to pull off, yet he does it brilliantly.